Blade 120 SR Review - As Good As The mSR? The Blade 120 SR Review - As Good As The mSR or Better? UPDATE: The Blade 120SR has now been replaced by the flybarless Blade 120S. Click here for my writeup on the new version. The 120 SR is ready to run with the success that the smaller Blade mSR has been enjoying for almost a year. For those of you (and there are so many) who have been having insane amounts of fun with the mSR and were wishing for a larger version - the 120 SR may be the bird for you. For folks who are not familiar with Blade mSR, here is my full review on it and why I think it is so good. The 120 SR as I said is a larger version (about twice as big) but utilizes the same proven technology and engineering that has made the mSR the huge success it is today. The target market for this new Blade is both the mSR owner looking for a larger machine as well as the micro coaxial heli pilot who wants to progress, but is uncertain if they are ready to take the plunge into a single rotor collective pitch RC helicopter such as the Blade 450 . I would be lying if I said the first thing I looked at on the Blade 120 SR in a somewhat negative way wasn't the electric tail motor. For those of you who have spent any time on my site, you know how much I dislike electric tail motors over a shaft or belt driven tail with variable pitch and why I gave the Blade SR such a harsh review, and on the other hand, the Blade 130X such a glowing review. The Blade 120 SR however, is much smaller and weighs a good deal less than the SR, on top of that it uses a much faster accelerating and decelerating coreless tail motor. Like the mSR/X, this means the reactive torque from the main rotors is not that severe and the coreless motor is able to keep up to the changing torque loads. In fact, tail hold on the Blade 120 SR is actually better than it is on the smaller mSR and trying to get the tail to blow out is essentially impossible. Full power climb outs from a hover introduced perhaps 10-15 degree maximum deviation off heading. Not sure how Blade has achieved this performance out of an electric tail but it is almost as good as a variable pitch tail rotor and is by far the best electric tail heli I have ever flown to date. Tail rotor motor life should also be pretty good as it is with the mSR and my 120 SR's tail motor barely got warm, even after some fairly aggressive flying working the coreless motor the entire flight. There is a fine line where electric tail motors do and don't work over a shaft/belt driven tail with variable pitch. The Blade 120 SR is close to that line, but thanks to the low torque off the main rotors and a fast coreless motor on the tail, it works impressively well. Like wise, fixed pitch on a bird of this size will also be okay since there is very little rotor mass allowing for fast accelerating and decelerating main rotor speed. This fast accelerating/decelerating head speed makes lift control manageable with little delay in response that is experienced on larger fixed pitch RC helicopters. 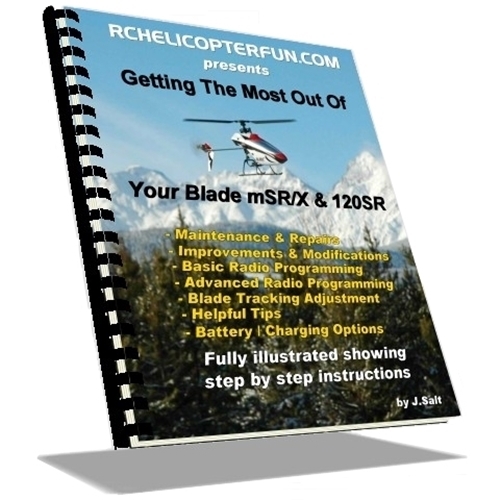 This video shows the basic flying characteristics of the Blade 120 SR and how it is very much the same as the mSR. The main thing to note is no tail blowout! The size is perfect for the yard! The rotor head on the 120 SR is a scaled up version of the mSR's rotor head with a 45 degree flybar that gives the same self corrective qualities as you're use to on your micro coaxial or mSR. This flybar design over a conventional 90 degree flybar arrangement on larger single rotor birds is what gives both the mSR and its bigger 120 SR brother hovering stability. The draw back to this inherent stability with a 45 degree flybar, especially with a faster flying single rotor helicopter is the somewhat annoying self corrective qualities. This stabilization is very aggressive and causes the heli to "pendulum" as it stabilizes back into a hover. Great for the beginner, but annoying as hell for more advanced fliers. The other quality the 120 SR rotor head shares with the mSR's is the dual position swashplate. This swash design, seen on the Blade mCX2 as well, allows you to move the rotor head pushrods to a different set of "out-set" balls on the upper half of the swash. The end result is more throw and increases the cyclic performance (faster flight in other words). Next up is an entirely new 5 in 1 control board. These 5 in 1's really are amazing and were first introduced on the now legendary Blade mCX . They not only include the electronic speed control (ESC) for both the main and tail motor, but the mixing function as well to seamlessly increase tail rotor speed as the main rotor speed is increased to overcome the increase in torque. The gryo is also built onto this control board as is the DSM2 receiver circuitry. Top that off with two micro linear servos to control the cyclic functions on the swashplate and you have the 5 components that make up these wonderful little control units. Unlike the other 5 in 1 boards on the smaller Blades that are located at the front of the bird; the Blade 120 SR's board is located behind the main mast and is also protected by a plastic cover. With the added weight of the 120 SaR (almost 4 times as heavy as any of the other Blade micro helis that use 5 in 1 boards), the improved location along with the plastic cover will go a long way to protect the control board. Better crash survivability in other words. Construction of the new Blade 120 SR is again very similar to the smaller mSR. Carbon fiber tail boom, flexible plastic crash resistant landing struts, strong one piece main frame, and pre-painted polycarbonate canopy with a clear window over the gray painted window on the mSR. The yellow color is a nice change for better visibility over the hard to see standard blue canopy offered on the mSR. There is also an optional red canopy and tail fin available if you would rather have a red 120 SR, but yellow will provide the best visual "foot print" in the air for most people. The added mass of the Blade 120 SR will of course mean more crash damage occurring over the 1 ounce Blade mSR. At close to 4 ounces, this is still a light little micro RC helicopter, but with that amount of weight pushing the bird into a hard object, parts will break more often meaning if you want a bird that can withstand multiple crashes, the mSR is the better choice. I have had a few respectable crashes into the ground with the 120 SR and so far everything is still in one piece (granted it was a soft lawn I crashed into). If it would have been the driveway, side of the house, or a tree trunk, I pretty much know I would be running to the hobby shop to pick up a few replacement parts. That said, most of the plastic parts on the heli such as the flybar, blade holders, rotor blades, and landing skids are very flexible and will take a lot of stress before breaking. Pictured here is a close up of the landing skids and how they mount in the frame. The skids are not only very flexible and practically indestructible, but actually have a hardened steel pin inside each of the four attachment pegs. This ensures the pegs won't sheer off during a crash (a problem common on the smaller mSR's landing skids). The 120 is just too much fun! It flies and feels very similar to the mSR, but the added size and mass really shows in the stability and performance over the mSR - especially when venturing outdoors. In fact, to appreciate the full potential of the 120, you pretty much have to be outside or at least have a very large amount of indoor space. It can cover a 100 foot span surprisingly quickly if you want it to. As I mentioned, the 45 degree flybar does introduce that annoying self correction so that takes some getting used to. Like the mSR, the 120 SR also suffers (and to a greater extent) from a very noticeable dissymmetry of lift in the rotor disc when flying at higher speeds. This again is where the benefits of a computerized radio can be be exploited by adding in some mixing to counter the increase in lift on the left side of the rotor disc during fast forward flight. Flight times were a nice surprise with the included single cell 500 mAh LiPo battery , and I was consistently getting a solid 7 minutes each flight so I now have my timer set to 6 minutes to ensure I don't over stress the little LiPo. I feel this is rather important since the battery does get a little too warm for what I consider healthy. This is where I think Blade could improve things by going with a 15C to 20C discharge rate battery; 12C seems a little weak and gets very warm. Unfortunately, we are stuck with this pack until the aftermarket sources bring a better one out or Horizon Hobby recognizes a 12C pack is just not enough in this bird. Yes, I can assure you will want several additional battery packs - 7 minutes goes by way too fast and the Blade 120 is way too fun. I am always somewhat amused (or perhaps taken back) every time a new micro heli (or plane) comes out on the market and one of the first things that is mentioned is that you can fly it outside in a little wind. Horizon Hobby is no different, and states the Blade 120 SR can handle some wind outdoors. If this is your first hobby grade RC helicopter however, I wouldn't put too much faith in that statement unless we quantify what exactly a "little wind" or "light breeze" is. This is after all a micro sized RC aircraft and without both a larger rotor diameter or higher rotor RPM and certain amount of mass, wind will toss the Blade 120 SR around and cause significant translational lift changes just like any other micro or small sized fixed pitch heli. It certainly is very flyable & enjoyable outdoors (much better than the mSR or even larger coaxials like the CX2/3), but any light wind or breeze much over 5 kph (3 mph) will toss it around - fun once you have mastered the controls and know what to expect, but scary and perhaps costly when you are first learning. There is no doubt that outdoors the Blade 120SR is much better than the mSR. The added size, bright color, and increased stability along with outstanding tail performance all contribute in a positive way to your outdoor fun. The minor shortcomings of the 45 degree flybar and lift dissymmetry in fast flight are easy to overlook - especially when the mSR experiences them as well, not so however with the mSRx. The picture to the right gives a size comparison of the Blade 120 SR in relation to some of Blades other birds. The 120 is in the lower left hand corner and as you can see is about twice as big as the mSR in the lower right corner. The 120 is almost the exact same size as the Blade CX2/3 and about half the size of the Blade 400. The Blade 120 SR is available in two versions. A Ready to fly version with everything needed to get airborne out of the box. As you can see, I bound the BNF Blade 120 SR to my trusty JR X9503 radio and even though this is a fairly basic RC heli (ie, non collective pitch), the 120 SR just like the mSR becomes a much better bird once bound to a computerized TX allowing you to adjust the setup and program in some mixing to deal with the lift dissymmetry. The computerized radios the Blade 120 SR can be bound to include the Spektrum DX6i, DX7, & DX8 as well as the JR X9503, 11X, & 12X. Some people may be wondering "why a larger version of the mSR?" The answer is actually very simple - it's what Blade's customers wanted. Time and time again I keep hearing "if only the mSR was available in a larger size"... Well, now it is and I suspect the Blade 120 SR will be every bit as successful as its little brother. Perhaps not quite as appealing to as large an audience, but certainly well worth the price of admission and for only 20 dollars more than the mSR - getting a bird twice the size makes the value much better in my opinion. Best tail holding performance I have ever experienced on an electric tail motor heli. Cost saving benefits of BNF for those of us with DSM2 radios. Looks good, bright color makes it easy to see in the sky. Better than expected battery flight times. Cool running main and tail motors. Larger size provides better overall stability. Because this is a Blade heli, parts are easy to find at almost every good hobby shop. Battery very warm after a flight - should have a 15-20C rated pack. Limited battery selection at this time. Self correcting stabilization qualities of a 45 degree flybar annoying but for a beginner makes perfect sense. Fragile & exposed tail motor wiring.